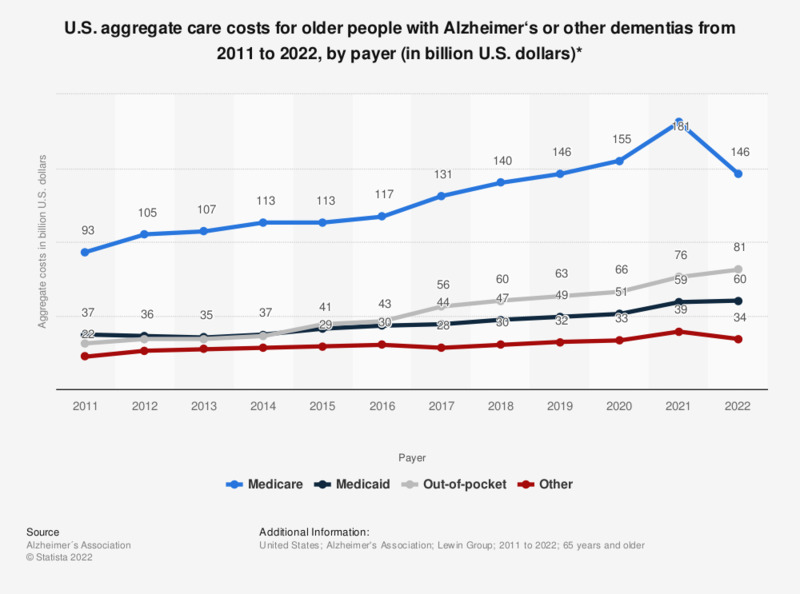 This statistic shows the aggregate costs of care for Americans aged 65 and older with Alzheimer‘s disease or other dementias in the U.S. from 2011 to 2019, by payer. In 2019, Medicare's aggregate care costs for such purposes came to around 146 billion U.S. dollars. * Data are in 2011-2019 U.S. dollars. All figures are estimates and rounded; 2011-2018 data were added from previous reports. “Other” payment sources include private insurance, health maintenance organizations, other managed care organizations and uncompensated care. Everything On "Geriatric health in the U.S." in One Document: Edited and Divided into Handy Chapters. Including Detailed References. How much do you think the unit cost is for an abdominal hernia repair on the NHS?